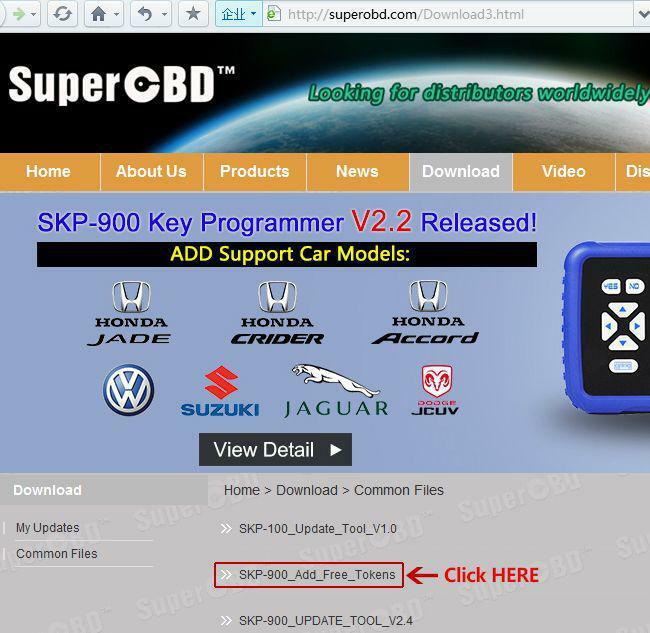 SuperOBD SKP-900 is a hand-held OBD2 Auto Key Programmer for multi-brand vehicles. The skp900 latest update version v3.6 has been released and adds new functions as below. Here our technician will share you how to update SK-900 Key Programmer. After the tokens used up, you can register in skp-900 official website and add the tokens for free. The dealer code is 1001. And then how to add free tokens for skp900 ? Firstly, You need to go to the official website: http://www.superobd.com/ to register and login, then click the “download” menu, download and install the program named “SKP-900_Add_Free_Tokens (2014-01-11)”. 1. Connect SKP-900 with computer using USB cable.